I had a craving for a late breakfast/early lunch BLT – classic bacon lettuce and tomato. I was out of L and only had a partial carton of grape T’s. I wasn’t about to let mere ingredients stop me! 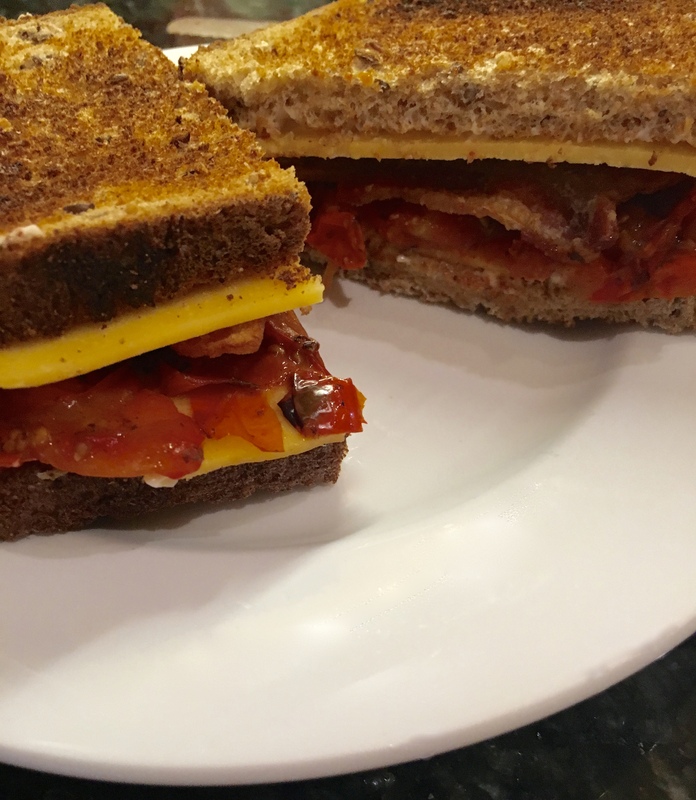 My goal was to create a BCT sandwich – bacon cheese and tomato. 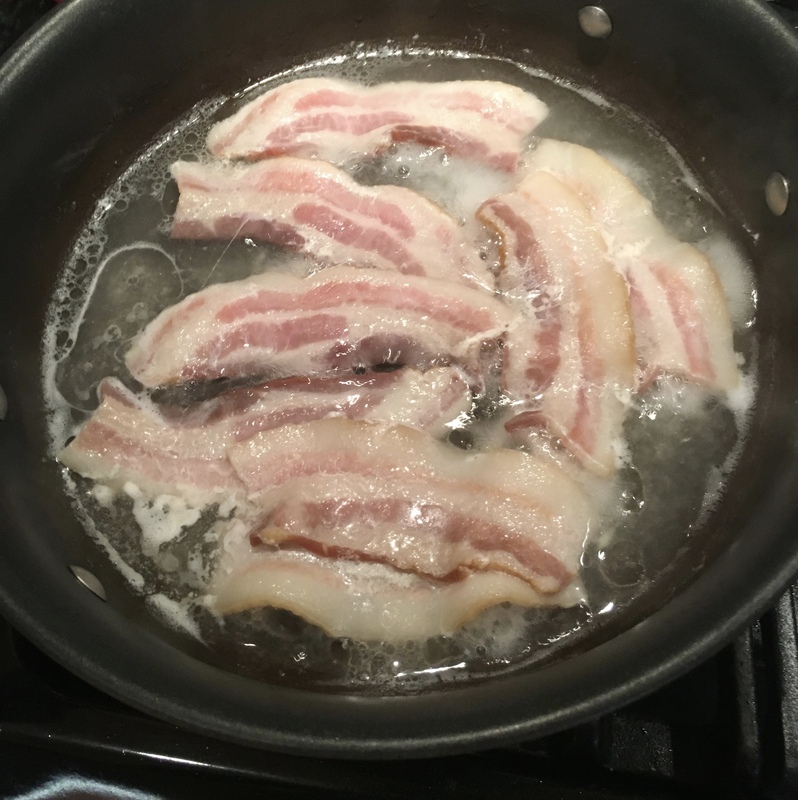 I recalled a bacon cooking technique I had tried and liked but hadn’t used in a long time. I sliced four pieces of thick-sliced bacon in half, put it in a pan and added a half inch of water and set it to simmer. Boiling the bacon renders the fat without splattering drippings everywhere.. 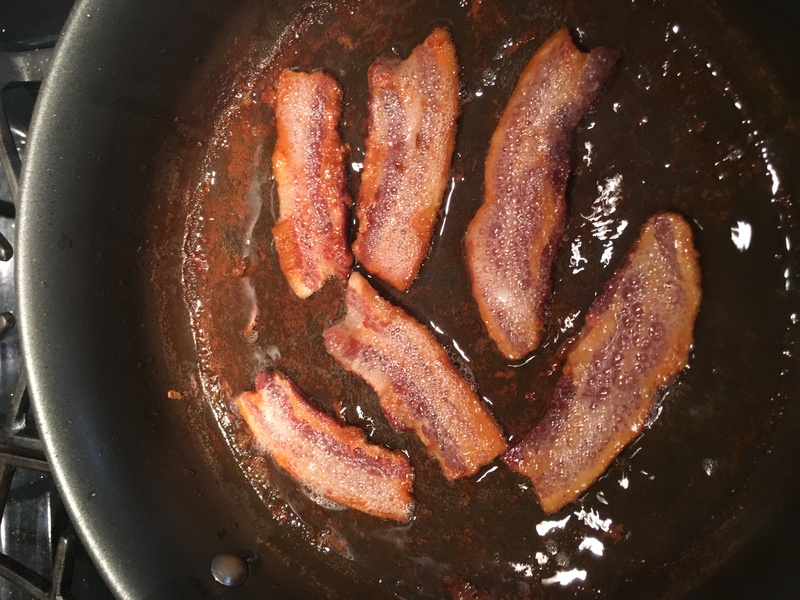 When the water in the pan evaporates, the bacon crisps up nicely in the drippings without making a spatter mess and it doesn’t curl. Bacon slices coming to a simmer in a half inch of water on the stove top. The water has evaporated leaving drippings in the pan to crisp the bacon. You can save the drippings for another use. I blot up bacon dripping with shredded news paper and toss them into the garbage when they are cooled. Makes clean up easier. While the bacon cooks, I made a blistered tomato sauce, a favorite you’ve seen here before. I halve the grape or cherry tomatoes using a technique friend Darryl taught me. Fill a saucer level with the tomatoes. Top with another inverted saucer and slice between the saucers to halve the tomatoes. Watch your fingers while holding the two saucers tightly together and move the knife through. It is a slick trick. I fill the depression in the bottom saucer tightly so the tomatoes don’t get pressed agains the far edge by the knife blade. I prefer a serrated blade for the slicing. 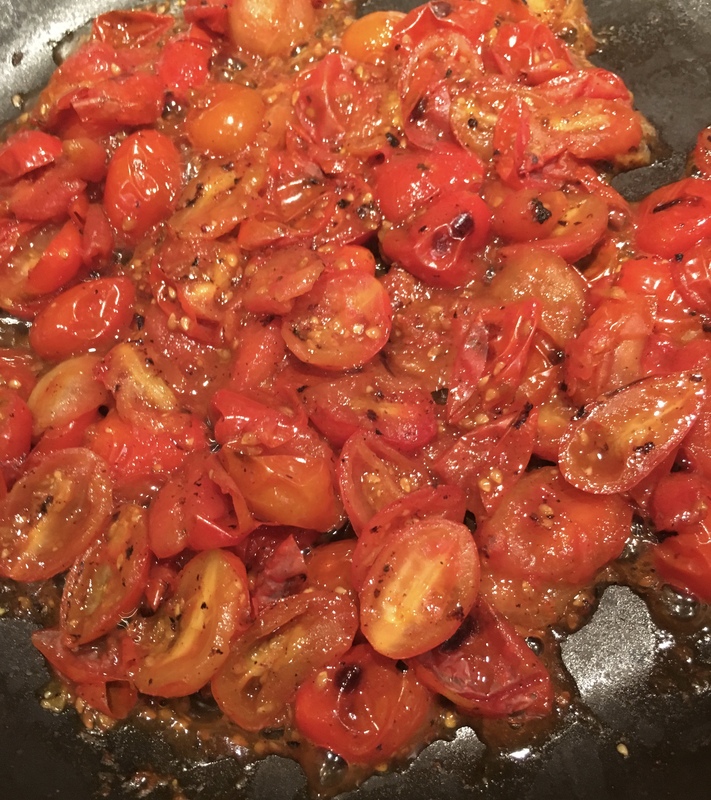 Once the tomatoes are halved,dump them into a hot dry sauté pan and let them get a slight blister or char. Reduce the heat and add a tablespoon or so of water to steam the tomatoes and cook them faster. I like to sweat the juice from the tomatoes and let them soften and caramelize. 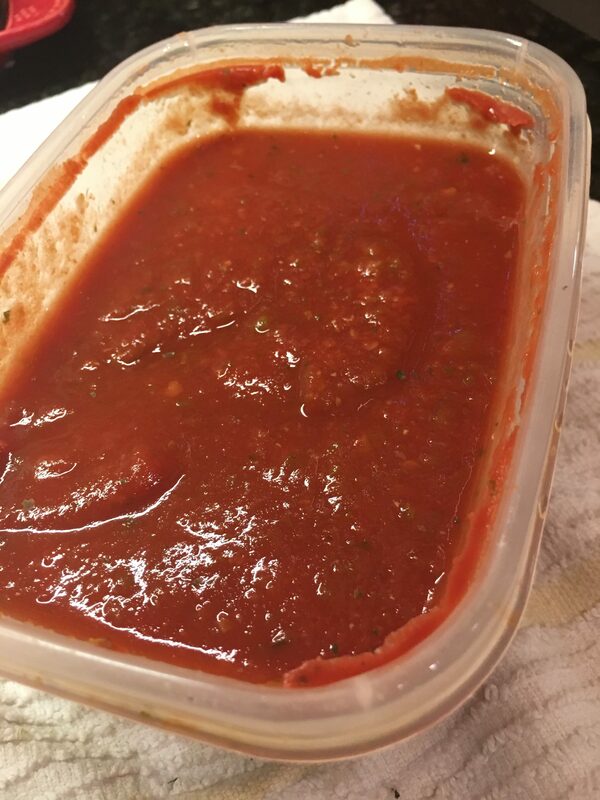 The result is a thick, chunky sauce with a flavor reminiscent of sun dried tomatoes’ intensity. This time I mushed the tomatoes a little with a potato masher to make them thicker and spreadable. Grape tomatoes go into a hot dry pan. Blistered tomatoes ready to mash a little and let dry out a tiny bit more. Now the assembly of the BCT. 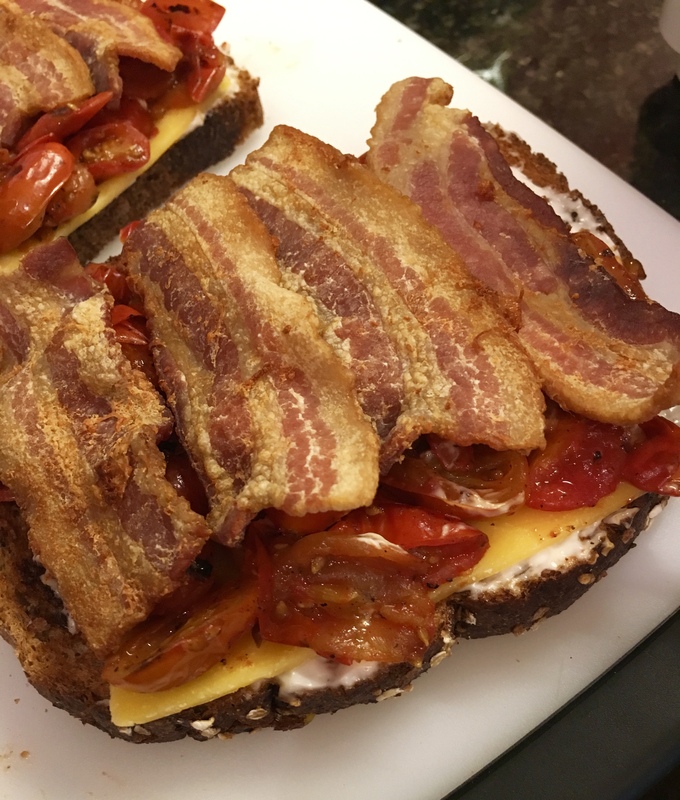 Toasted multi-grain bread, a schemer of mayo to seal the bread, a slice of sharp cheddar to hold the tomatoes, a heaping spread of blistered tomato sauce, strips of crisp bacon and the toast topper for the sandwich. BCL under construction. Layers of toast, sharp cheddar, blistered tomatoes and bacon. There is always an internal debate over adding a second slice of cheese on top of the bacon. Fortunately, the second slice of cheese won! The BCT is now an official creation of the Gringo Gourmet Academy. No recipe. Just ingredients that work together and a review of some good techniques to try. I ran across a new potato salad that is simple enough to almost be criminal! Potatoes, poblano chiles, cilantro, canola oil, brine from pickled jalapeños and a dash of salt. And even better than simple, it is delicious! 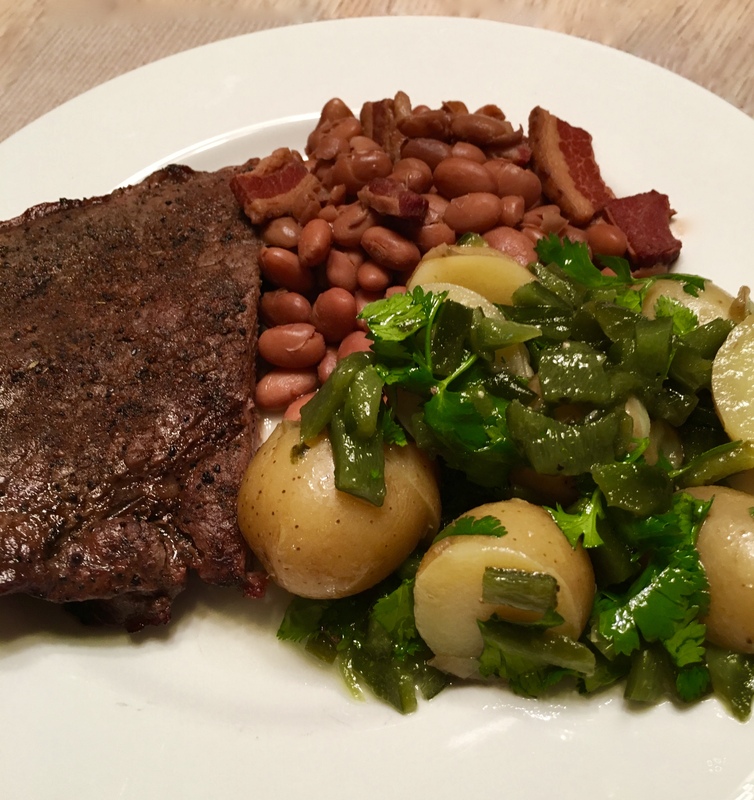 Poblano Potato Salad with sides of steak and beans. So easy and very, very good! I didn’t time the recipe, but it had to come in at close to 30 minutes including prepping the chiles. Preheat oven to 450°. Place peppers on a foil-lined baking sheet. Roast 20 minutes or more until skins are blistered and charred. Wrap in foil (or place in a lidded casserole dish) and let stand 20 minutes or so until cool enough to handle. Remove stems, skins and seed from peppers; chop coarsely. While chiles are cooling, cook potatoes in lightly salted boining water 12 – 15 minutes or until tender. Drain. Halve baby potatoes or cut fingerlings in thirds. You want bites to be about ¾ inch. Beat canola oil and pepper brine until emulsified, stir in cilantro. Toss potatoes and chopped chiles with the emulsified oils. Adjust with a little salt. I found a recipe for Creamy Grits and Black Beans that sounded good. It had a companion recipe for a Pice de Gallo Salad. 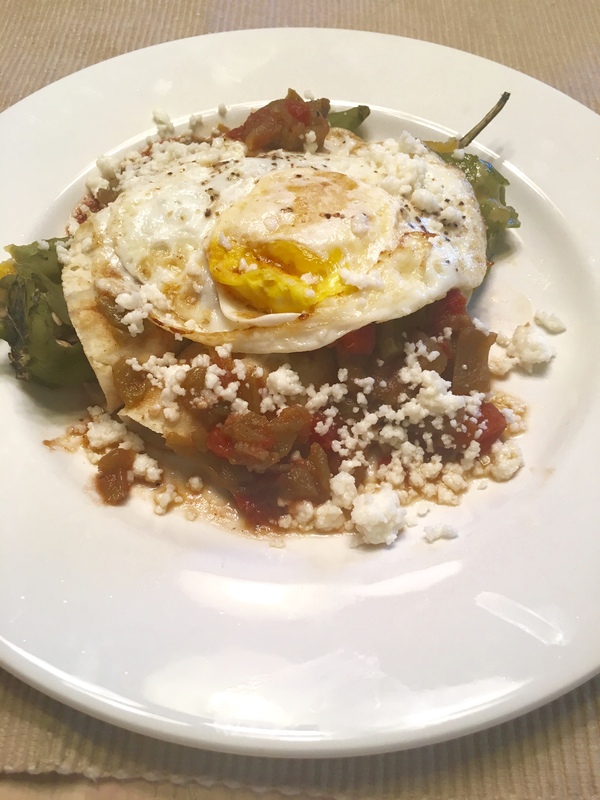 It perked up my interest because I’d been reading about a new cookbook by Anthony Lamas, a Mexican American chef in Louisville, KY, and Gwen Pratesi who are adding some Mexican and Latin touches to Southern-style cooking. I’ve ordered it digitally and am looking forward to exploring it. I forwarded the grits and bean recipe to my vegetarian daughter. We are to compare notes when we both have made it. The spices called for made my mouth water. The picture with the recipe was a little bland looking, so I started to play with it. I roasted the corn in a hot dry pan to give it a little color and intensify the flavor. Instead of canned chiles, I bought roasted green chiles, peeled them and gave them a coarse chop for some extra color in the grits. I used yellow grits (polenta), as well. The recipe’s salad was so simple (read that skimpy looking) I knew I didn’t want it on the side. It it didn’t look finished, so I decided play to with it and use it for garnish on the dish. Plated, its not bad, but a little on the blah side visually. A sprinkle of cilantro makes a big difference visually! And then the big finale! I wouldn’t mind this as a side dish or as an entree for the house vegetarian, but I’m a carnivore. 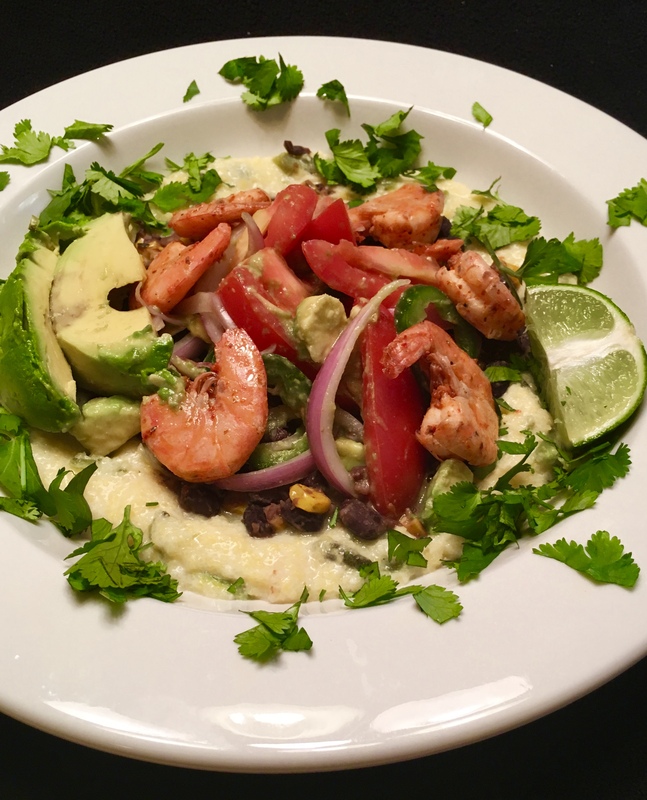 I decided to do a southern riff on grits and shrimp by adding a Mexican beat. I love Tajin chile/lime powder and use it on many dishes. I marinated shrimp in a little olive oil and a lot of Tajin for a couple of hours while I napped before starting dinner. Tajin is a soft heat with a bright lime under current. The shrimp picked up some color from the Tajin. A couple of slices of avocado left from the avocado diced for the salad and a wedge of lime make a big difference on the plate. Meatless Monday was a success if you count seafood as a meatless addition to the meal. This dish comes together quickly (unless you count the time it takes to peel roasted chiles), so make the salad first. Heat milk in a saucepan until boiling. Reduce heat to medium-low and gradually whisk in grits and chiles, stirring to prevent lumps; cook five minutes. Stir in cheese, season with salt and set aside. Heat a medium sauté pan. Add corn and brown slightly. Add oil and garlic, stir while garlic softens, stir in spices and stir until they bloom (release their flavor and scent), add beans and 1/4 cup water and cook until water has evaporated and ingredients in pan are heated through. You can mash the beans a little with a potato masher if you wish. 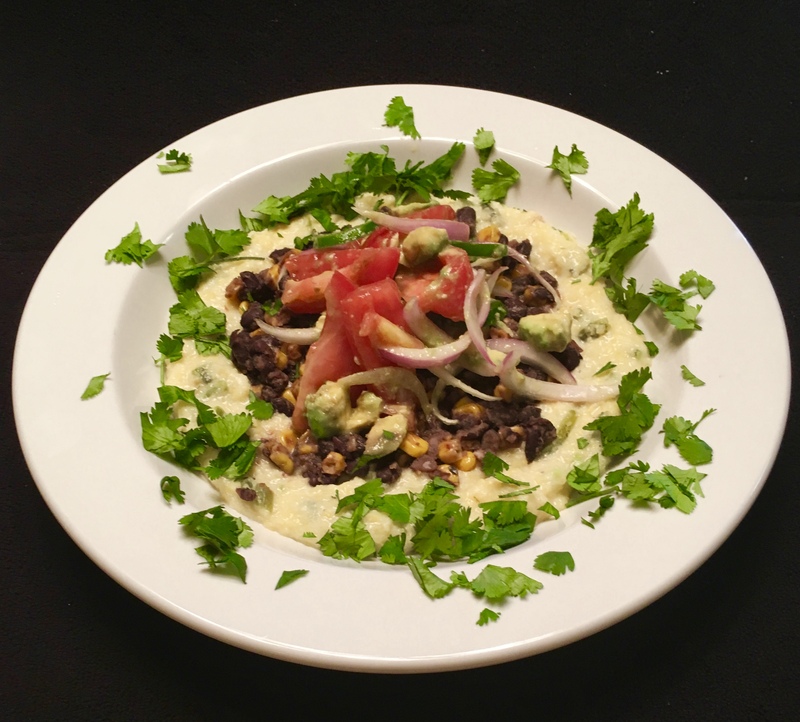 Serve grits topped with beans, diced avocado and a squeeze of lime. 1 Tbsp fresh lime juice. Drain onion, combine tomato, onion, jalapeño; stir in lime juice and season with salt. I added shrimp to the dish. I marinated the shrimp in olive oil and Tajin chile lime powder and cooked them in the dry sauté pan, then set them aside in a bowl. I wiped the pan clean and lightly browned the corn in the dry pan, then added the other ingredients. I put the avocado in with the pico salad and saved the cilantro for garnish on the whole dish. My avocado was large, so I diced half of it for the salad and served the other half sliced as garnish. I used the salad on top of the grits and beans instead of as a side dish. I was putting things away and glimpsed my underused panini press. Inspiration hit – panini for breakfast. 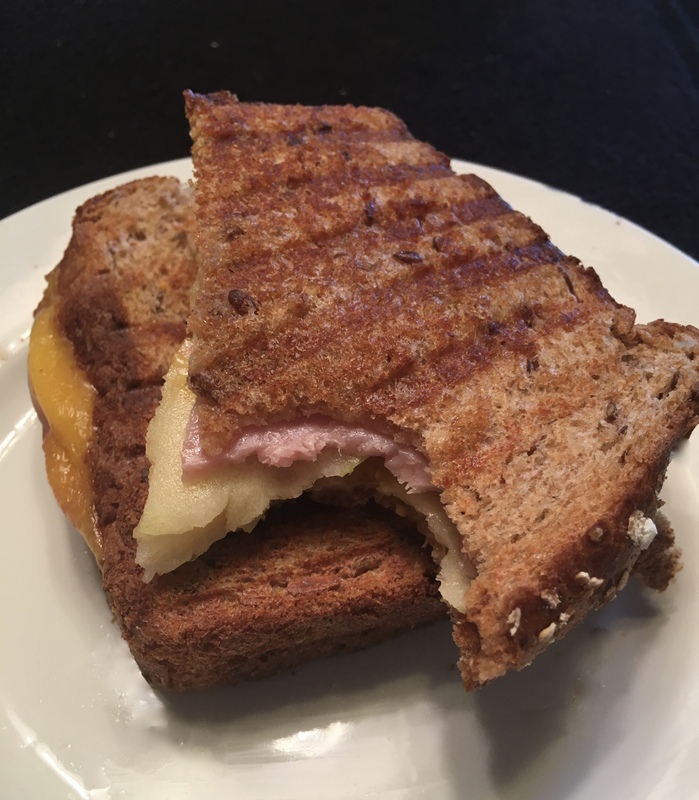 Whole grain bread, sharp cheddar cheese, a slice of ham a schmear of whole grain Dijon mustard on one slice of bread and a schmear of mayonnaise on the other, and then, the clincher, Pink Lady Apple sliced thin on a hand-held mandoline and layered between the cheese and ham. A few minutes on the heated panini press and it was love at first bite. My favorite apple is the Honey Crisp for flavor, texture and sturdiness under heat. A very close second is Pink Lady which is just a tiny bit more sweet than the Honey Crisp. One of the joys of gardening in the Southwest is winter greens. Chard, mustard, turnip, collards and even spinach brighten our tables through our mostly mild winters. And, thanks to modern agriculture, we can continue to enjoy them year ’round from the super market. I frequently serve sautéd or steamed greens with slivers garlic and bits diced of bacon. I’ve posted variations on greens and beans many times. The are a great combination and very versatile in soups and as side dishes. With a little tweaking, they can be the stars of the plate. Wilted red Swiss chard with shallots is beautiful to behold. A splash of sherry vinegar makes it extra special. Simple ingredients enhance Swiss chard. Finely chopped chard stems add color and and texture; sliced shallots and grated garlic add savory depth the the mildly bitter leaves. Sautéing the shallots and minced chard stems together deepens the pink of the shallots and makes the greens spectacular on the plate. They steal the show from a pork chop and fingerling potatoes. Use the stems from the Swiss chard; chopped fine, they add texture and a layer of flavor to any sauté. I’ve discovered that baby peas and asparagus are good companions. I have always been fond of alliums. Onions and garlic are staples of most kitchens. Leeks, shallots and chives are there, too. When I found a recipe for braised chicken thighs with asparagus, peas and leeks, I couldn’t resist. It takes a little prepping, but is well worth the work! 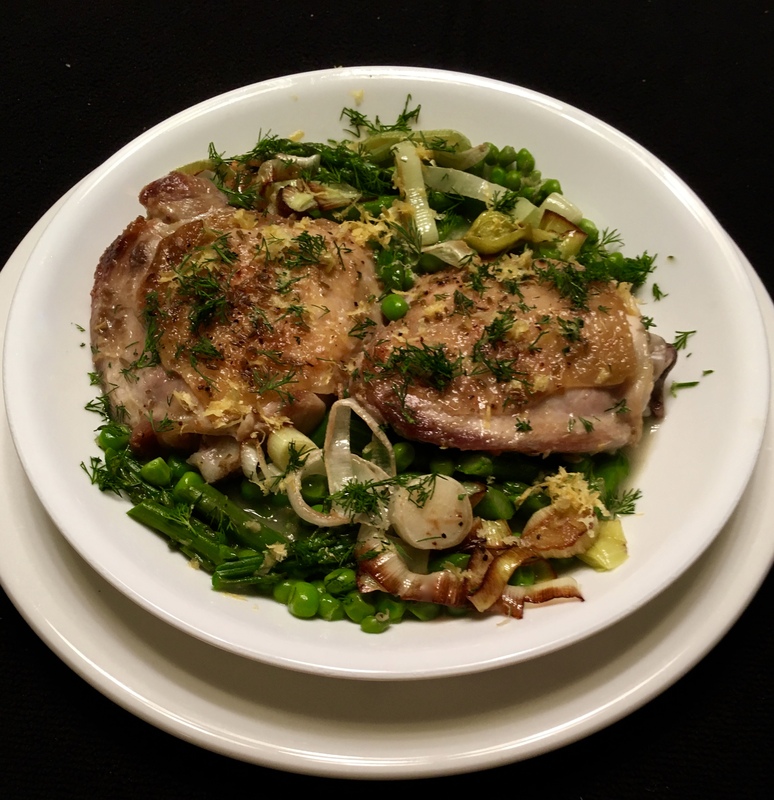 Braised chicken thighs, asparagus, peas and leeks is a savory broth of wine wine, lemon juice and chicken stock. If you see or feel dirt in the leeks, rinse well, separating layers, then pat dry; otherwise, leave rounds intact. Heat 2 Tbsp. oil in a large skillet over medium-high until hot but not smoking. Add leeks in a single layer; season with 1/4 tsp. salt and a pinch of pepper. Reduce heat to low and cook, turning once, until leeks are lightly golden, 16–18 minutes. Separated rings of leeks brown very quickly. Transfer leeks to a plate; reserve skillet. Lightly crush fennel seeds with the bottom of a heavy skillet or pot. Pat chicken thighs dry with paper towels and season with fennel, 1 1/2 tsp. salt, and 1/4 tsp. pepper. Heat remaining 2 Tbsp. oil in a 5–7-qt. Dutch oven or large wide saucepan over medium-high. Cook thighs, skin side down, until well-browned, 12–14 minutes. Transfer skin side up to a plate. Pour off and discard fat. Add wine to pot, bring to a simmer, and cook, scraping up bits from bottom of pot, 1 minute. Add broth and return chicken skin side up to pot. Lower heat to medium-low, cover pot, and cook until chicken is cooked through, 15–18 minutes. Meanwhile, combine asparagus, peas, and 2 Tbsp. water in reserved skillet, cover, and cook over medium heat until asparagus is crisp-tender, about 5 minutes. Remove from heat. Add 1/2 tsp. lemon zest, remaining 1/4 tsp. salt, and a pinch of pepper; stir gently to just combine. Divide chicken, asparagus mixture, and reserved leeks among large shallow bowls. Bring broth to a simmer, add lemon juice, then ladle into bowls. Top with dill and remaining 1 Tbsp. lemon zest. 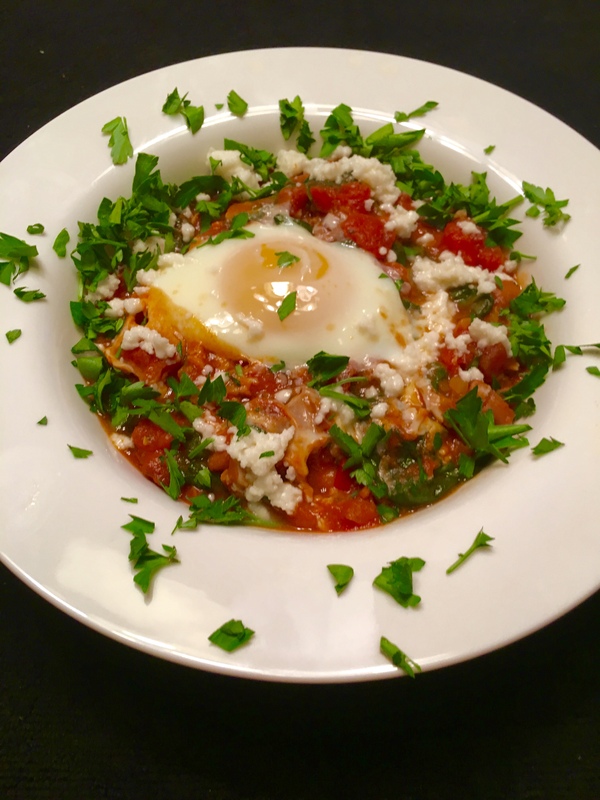 I’ve seen several recipes this spring for shakshouka. I think I may have finally learned to pronounce it. The dish features eggs poached in a tomato sauce. I’ve seen it as a breakfast and as a dinner meal. It appears that every cook has his or her own version of the condiments for the sauce and even different protein content. The dish has middle eastern and middle European versions and might be claimed by many ethnic groups. After finding recipes containing jalapeños, decided to look up Mexican Jewish food. That continues to be quite an adventure. I’ve learned there are more than 50,000 Sephardic Jews in Mexico. The Sephardic Jews are those who, during the Spanish Inquisition in the late 1400’s had to become Catholics, leave Spain or die. Many became Catholic on the outside but remained observant Jews in secret. Many still suffered persecution and immigrated to countries across the globe and learn to blend their traditional dishes with those of their new lands. I discovered Susan and Alex Schmidt, a mother daughter team, who now live in California, but have roots in Mexico’s Sephardic Jewish community. The two have a blog called Challahpeño which discusses a blending of Mexican and Jewish foods in ways that amaze me. They talk about Pozole con Matzoh Balls, Schnitzel Torta, Totopos de Gribenes con Guacamole and even Schmaltz Tamales. They have a cook book in the works, but I haven’t found that it has been published so far. One article I found suggested that my favorite Lenten bread pudding, capirotada, might have been created so that the Sephardic Jews could have unleavened bread during Passover. Interesting thought, but who knows for sure? However it came about, capirotada is a big Lenten tradition with me! One of the recipes I found had chickpeas, feta cheese and jalapeños and cumin among its ingredients. That started the wheels turning and I figured I could make a Mexican Jewish influenced Shakshouka. Salsa captured at a family gathering from one of my niece’s sisters. Great flavors and real heat. 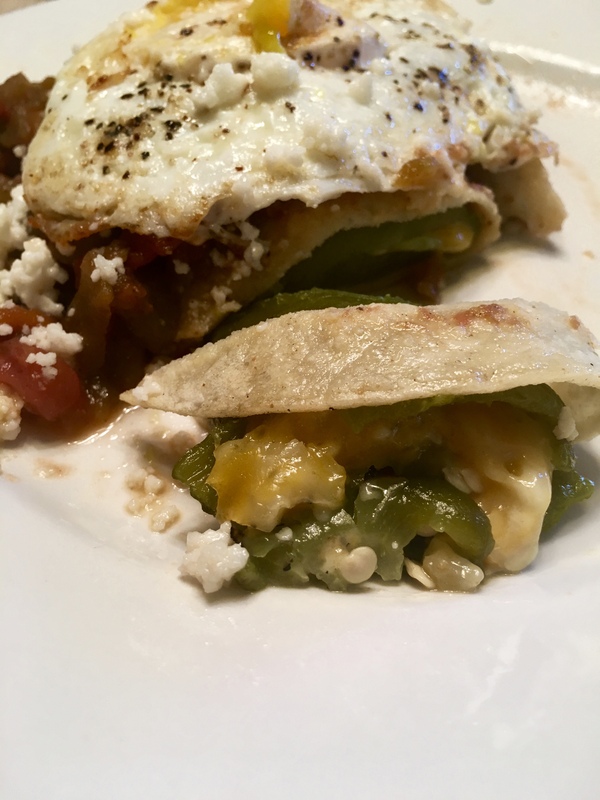 I followed bits of three recipes and came up with two good servings of my Mexi-Shakshouka, below is what I think I did. In an oven proof skillet, heat olive oil and sweat onions until translucent and soft. Add garlic and let bloom for a minute or two. Add cumin and let bloom for a minute. Pour tomatoes and tomato sauce into pan with savories and bring to a simmer. Add greens and let wilt and become tender. Add salsa one spoonful at a time and taste for heat level. Let simmer a few minute for flavors to meld then add beans and warm through. Simmer long enough for the sauce to thicken, but remain wet enough to poach the eggs. Break eggs carefully into the sauce. Transfer the skillet to the oven. Cook about 8 minutes until the egg whites have set, but the yolks remain soft. Remove from oven, garnish with parsley or cilantro and cheese and serve warm. Notes: The recipes I found suggested cooking the shakshouka in a cast iron pan. I’m wary of acidics like tomatoes in cast iron. I used a heavy anodized aluminum pan. My friend, Daryl, posted a Shakshouka with skin-on, bone-in chicken thighs and lemon and a range of spices which sounds delicious. I’ll try his recipe next time. Passover starts a week from tomorrow night, so I’ll commemorate with at least one more shakshouka during the week. Saltimbocca – in Italian it means “jumps in the mouth.” Traditionally it is made with veal marinated in wine and cooked with prosciutto and sage. Delicious, but it is difficult to find veal in most supermarkets here. 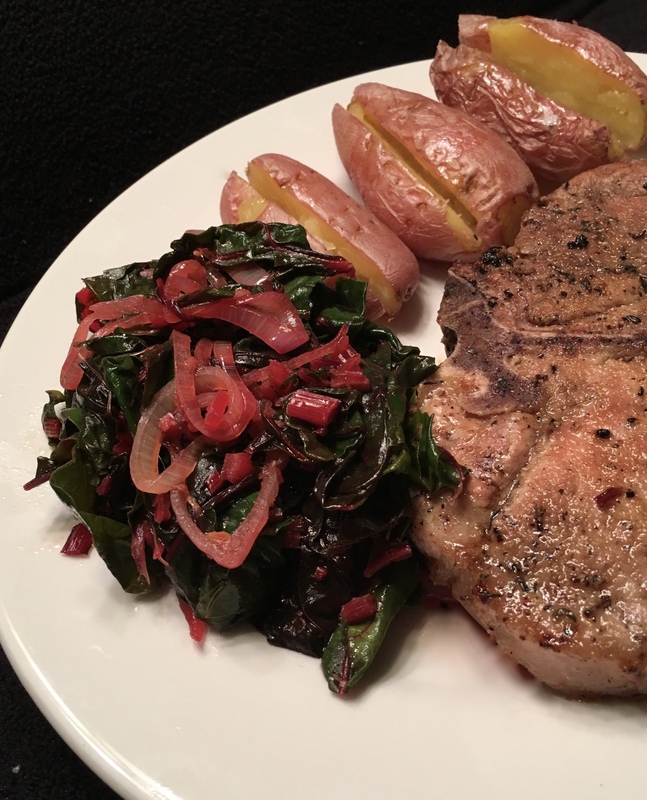 I substitute a pork loin chop and it, too, is mouth jumping good! I also use thin pork loin cutlets to make “Squeal” Picatta. 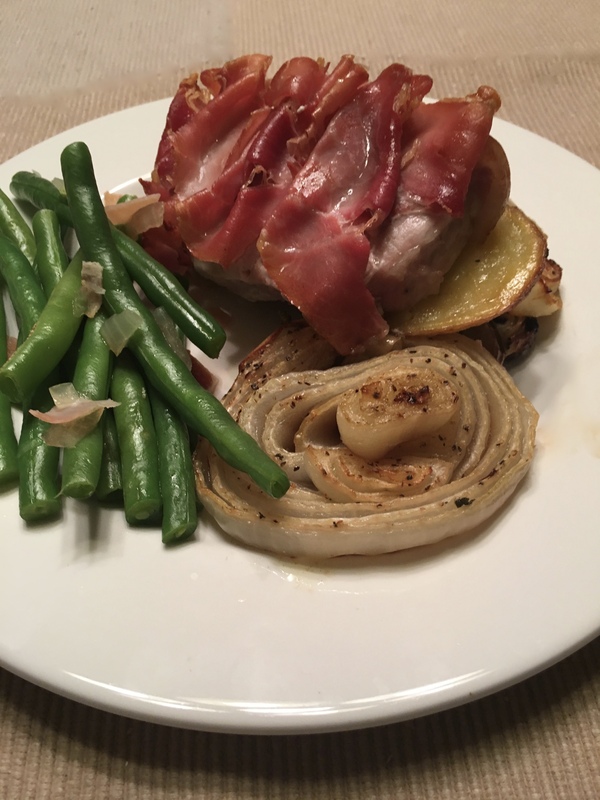 I roasted the Saltimbocca on a sheet pan with potatoes and onions and served it with a side of green beans steamed with onion and bits of prosciutto just until they were bright green and still had some crunch. I am not a fan of faded soggy green beans. 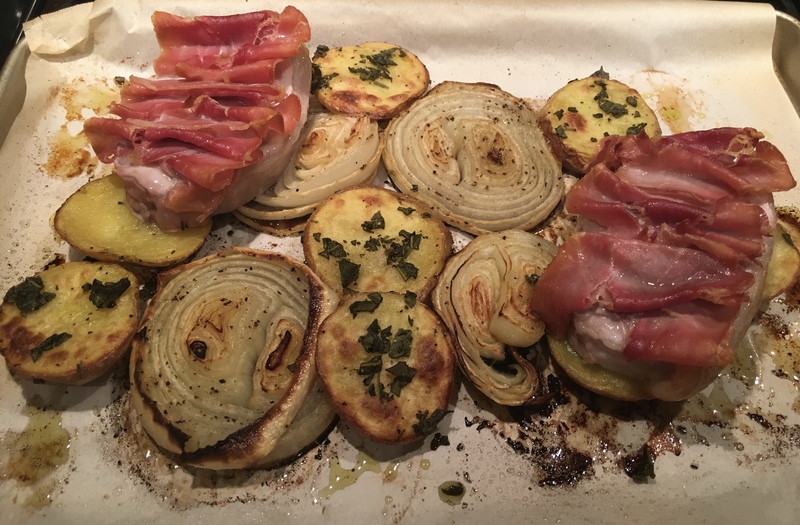 Pork “Saltimbocca” with roasted onion and potatoes right out of the oven. Inhaling the scent of onion, sage and pork made it difficult to wait long enough to put it on a plate. But I persevered and plated it up. Pork Saltimbocca will be back on this table soon! I halved the recipe below for two servings. I had my deli guy cut six paper thin slices of prosciutto for me. “Pleat” folded, three slices for each chop was almost enough prosciutto for me! Preheat oven to 450°. Line a rimmed baking sheet with parchment paper*. Pierce pork slices all over with the tip of a paring knife. Place in a dish just large enough to hold pork in a single layer. Pour wine over and let marinate at room temperature while preparing other ingredients. 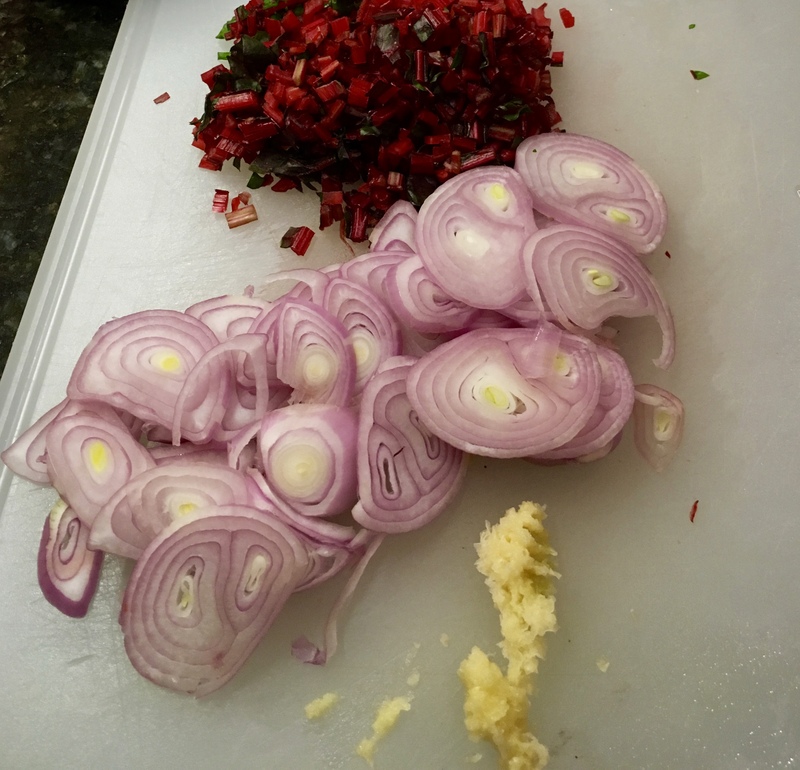 Place onions in a medium bowl, drizzle with 1 Tbsp oil, and season with salt and pepper. Toss gently to coat without breaking up slices. Transfer onions to prepared baking sheet, spreading out in an even layer. Combine remaining 2 Tbsp oil, potatoes, and sage in same bowl; season with salt and pepper and toss to coat. Place potatoes on sheet, tucking in among onions. Roast onion-potato mixture until potatoes begin to brown around the edges, about 20 minutes. Remove pork from wine and pat dry. Season with salt and pepper and top each pork slice with 2 (or 3) prosciutto slices. Place pork on baking sheet atop potatoes and onions. Roast until an instant-read thermometer inserted horizontally into center of pork registers 135°, about 10 minutes. Let rest for 5–10 minutes. *I keep both quarter and half size sheet pans in my cabinet and use them frequently. If you search at Sam’s and Costco, you can find sheets of aluminum foil in two sizes in boxes that work like tissue boxes. Pulling out a sheet at a time is very convenient and they are a good site for my sheet pans. I wish parchment paper was packaged that way. Is There Ever Enough Asparagus? I’m still on an asparagus binge. So many ways to make it. So many things it to serve with it. One of my favorite treats is lamb shoulder chops. 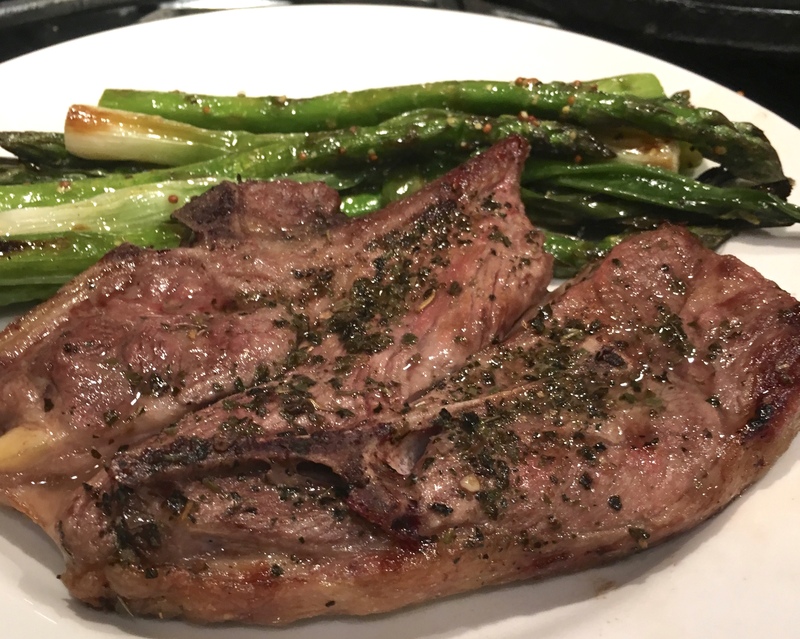 Shoulder chops have all the great flavor of lamb and are very inexpensive. The shoulder cut has some interesting bone structure, but it is well worth a little extra knife work on the plate. I do lamb chops very simply. I lightly coat the chop with a few drops of olive oil, then sprinkle it liberally with dried oregano or dried Italian seasoning. Then I let it sit at room temp for about half and hour. A drizzle of fresh lemon juice finishes the prep and it goes on to a medium grill. I check meat temps on the grill with an instant read thermometer. I take lamb off the grill at about 150º internal temperature and let it rest five to 10 minutes. After plating, a few more drops of lemon juice is a good thing. Grilled lamb shoulder chop with Italian seasoning and lemon juice. While the lamb chop was delicious, the real treat on the plate was ASPARAGUS!!! This time, grilled with spring onions (scallions work) until tender with just a little char, then, served with a lemon dressing. So simple. So good! SERVINGS: 8 I reduced the asparagus and onions down to two servings (about half a bunch of each) and halved the dressing ingredients with no problems. Prepare grill for medium-high. Whisk lemon zest, Meyer lemon zest, lemon juice, Meyer lemon juice, mustard, and ¼ cup oil in a medium bowl to combine; season dressing with salt and pepper (if you don’t have Meyer lemons, use regular lemons in their place). Place asparagus and spring onions on a rimmed baking sheet and lightly drizzle with oil. Season with salt and pepper; toss to coat. Transfer to medium hot grill, cook, turning once, until lightly charred and crisp-tender, about 4 minutes. Serve drizzled with dressing.